Started by metmike - April 9, 2019, 7:16 p.m. I copied joj's post below that started a thread which is not allowing any comments for some odd reason.........at least not from me. Are you sure you want to delete this post: Biden-2? By metmike - April 9, 2019, 7:17 p.m.
Where were the outraged Biden supporters when Judge Cavanaugh was being brutally smeared? Smearing is only smearing if the target is somebody that we like. When it's somebody like Trump..............who's been smeared for over 2 years by the MSM(around the clock every day at stations like CNN) and democrats............it's seen as him deserving every bit of it and more. Right, like this Russian collusion hoax(just one example) was not used for 2 years. It's perfectly ok to smear somebody that we despise and deserves it. People like me, "climate deniers" have been smeared for over a decade now. Discredited because we have authentic facts/evidence that contradict the manufactured climate crisis. I'm sure that you must remember watching numerous political ads on television from the last decade of elections that were 100%, pure smear campaigns against their opponent. This is the society that we live in and only being outraged when it happens to somebody that you like will continue to provide ammunition for it to continue(because its designed to hurt people that we don't already like). They are all repugnant to me............from both sides but because Biden is the guy who is the front runner, potentially facing Trump in the 2020, we are getting these interpretations, like its shocking and a "new" tactic from a person(Trump) that is so easy to hate. Are you sure you want to delete this post: Re: Biden-2? By TimNew - April 10, 2019, 7:30 a.m. If you are allowing/have allowed any aspect of the Biden or Cavanugh stories to in any way affect your opinion of people or events, other than seeing them for the preposterous nonsense that they are, you are admitting that you allow yourself to be told what to think and how to react to anything. Are you sure you want to delete this post: Re: Re: Biden-2? By kermit - April 10, 2019, 7:33 a.m.
Are you sure you want to delete this post: Re: Re: Re: Biden-2? By joj - April 10, 2019, 12:28 p.m. If Cavanaugh's accuser, who was willing to take a lie detector test, and who had corroborating testimony from multiple people at the time of the alleged sexual assault was a fabrication then she is guilty of perjury and should be prosecuted. If not, then you are comparing sexual assault to excessive hugging. 12 women stepped forward to describe Trump's sexual aggressive behavior, which probably means he engaged in that activity over a 100 times. And he admitted to it in a boasting fashion. That he and his supporters then attack Biden, is beyond the pale. Now please respond with Climate debate references. By metmike - April 10, 2019, 1:40 p.m.
"Smearing is only smearing if the target is somebody that we like. "It's perfectly ok to smear somebody that we despise and deserves it." "Now please respond with Climate debate references." You have either been living in a cave or are just looking for an argument. The concerted effort to discredit the scientific consensus over man-made global warming has been continuing for two decades in the United States, and shows no sign of weakening. Dr. Spencer is a top authority on climate science and been smeared for over a decade. Obama was noted for calling us deniers but also coined the term "flat earthers" What's funny about his tweet(lie)below is that us deniers, have a hard time finding anybody to debate us on the climate science that they insist is settled(would give our points too much credibility they say). So the manufactured crisis scheme that involves smearing the side that disagrees, tries to make you think that other side is afraid to debate them.........when everything is the complete opposite of that. "Climate deniers in Congress refuse to even debate the issue. Make sure they don't get away with it"
Stossel invited a dozen scientists to debate "denier" Dr. Spencer on the science..........they all refused. Dr. Schmidt agreed to come on as long as there was no debate and he was only allowed to repeat his prepared statementments without being challenged or debated by the climate scientist "denier"
By metmike - April 10, 2019, 1:47 p.m. 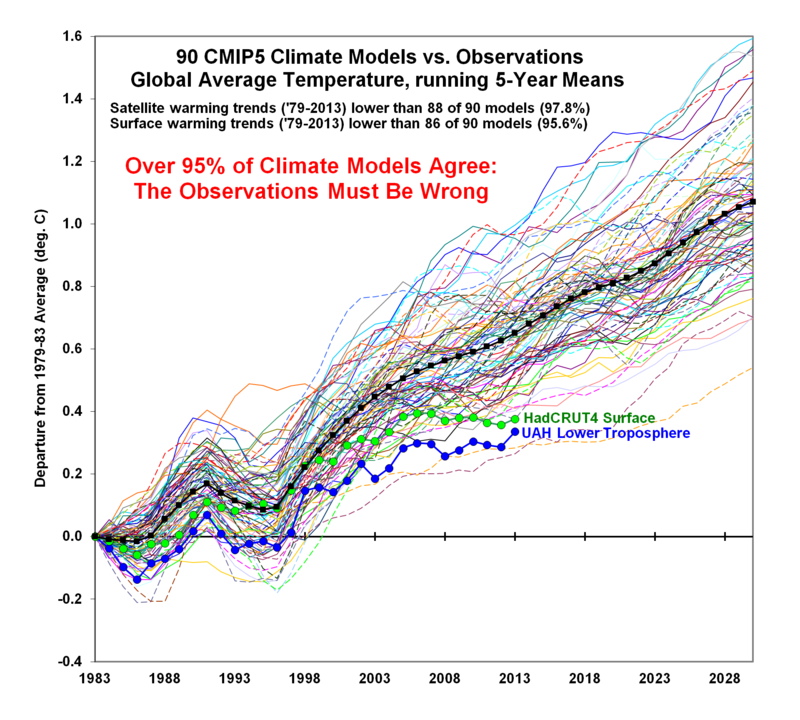 There's a good reason why nobody would come on to debate Dr. Spencer..........this would have exposed the weaknesses in the climate crisis theory which is entirely based on programmed model simulations that are busting in the real world..................so they just smear the guy. By TimNew - April 10, 2019, 2:49 p.m.
"If Cavanaugh's accuser, who was willing to take a lie detector test, and who had corroborating testimony from multiple people at the time of the alleged sexual assault was a fabrication then she is guilty of perjury and should be prosecuted. If not, then you are comparing sexual assault to excessive hugging." If you give this more than 3 seconds of attention, you are admitting that you can be told what to think and how to react to anything.